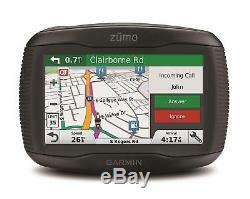 New Garmin Zumo 395LM Motorcycle Bike Sat Nav UK & Europe Lifetime Maps. Premium Motorcycle GPS for New Adventures in Riding. Glove-friendly, sunlight-readable 4.3 inch dual-orientation touchscreen with rugged design for harsh weather. Garmin Adventurous Routing finds curvy or hilly roads; limits major highways. Rider alerts for sharp curves, state helmet laws, speed cameras and more. Bluetooth for hands-free calling and smartphone notifications right on your Zumo screen. Control music from MP3 player or smartphone; stream Pandora and Spotify music services. To enhance road awareness and encourage a safer ride, Zumo 395LM provides helpful alerts for sharp curves ahead, speed changes, railroad and animal crossings, school zones and more. Additionally, youre notified when you need to check state helmet laws or when youre about to drive the wrong way on a one-way street. You also receive alerts for nearby red light and speed cameras. Plus, for longer rides, a fatigue warning. Will even suggest break times and potential rest areas worth considering after hours on the road. The Zumo Up Ahead feature lets you easily see places of interest and milestones along your route, without leaving the map view on your navigation display. Plus, Easy Route Shaping lets you add a point on the map to adjust your route, so you can ride through preferred areas or follow specific roads. The Best Brands is a Trading name of JD Sales LTD which is a family run business with over 30 years experience, providing quality service to our customers! Here at Best Brands we believe in bringing you the latest Must have Technology and Consumables at prices which are better than anywhere else. The products we sell, we are fully authorised retailers for. 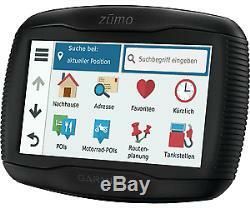 All of our products are of top worldwide brands, For example: Garmin, TomTom, Mio and Casio. We also have a busy town centre retail store where items can be viewed or picked up. We carry stock of all the top brands that you will find in the big department stores but offer huge savings. Your statutory rights are unaffected. If you choose to return an item, please do take care of it whilst it is in your possession. Please return your unused product; with the original packaging, accessories and manuals. Items that have had holes drilled through them. In the event that the services are provided with your agreement prior to the end of this 14 Calendar day cancellation period, you lose your cancellation rights from the moment that the services are provided to you. Get all the latest News, Updates and Special Offers about our store. 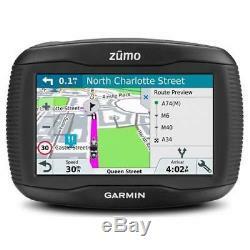 The item "New Garmin Zumo 395LM Motorcycle Bike Sat Nav UK & Europe Lifetime Maps" is in sale since Wednesday, July 11, 2018. This item is in the category "Vehicle Parts & Accessories\In-Car Technology, GPS & Security\GPS & Sat Nav Devices\Portable GPS Systems". The seller is "the_best_brands" and is located in Warminster. This item can be shipped worldwide.